Popular motojournalist Clement Salvadori has been sharing his stories from the road with the readers of Rider magazine since 1988. Now, 101 of those engaging Road Tales have been brought together in one book, cleverly illustrated by his long-time friend Gary Brown. 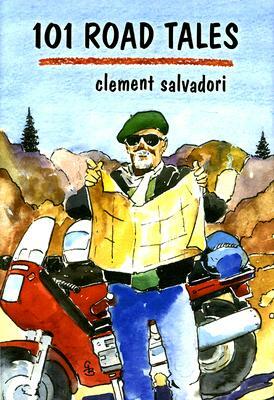 Salvadori loves to travel by motorcycle and loves to write. His combining the two has given him a thoroughly satisfactory life, and his contentment and joy of living shine through this collection of columns from the past two decades. Though he does admit to being destination-oriented at times, many of his columns focus on the little things that make the journey itself the most memorable -- the rhythm of the road, the music of the bike, the beauty of the ride, and the exhilaration of being at one with the bike and the road. Meet some of the characters he has encountered, laugh with him at some of his blunders, and join him for bread, cheese, wine, and a stupendous vista somewhere away from the hustle and bustle of humanity. Clement Salvadori bought his first motorcycle as a teenager and has been riding ever since -- in more than 70 countries on six continents. A well-known name in motorcycle journalism, he has written over 1,000 articles for several dozen motorcycle magazines, including a monthly column in Rider magazine entitled "Road Tales."